The Satanists in Washington and Brussels must be reveling in their orgasms at the videos and news that their monies are well spent. 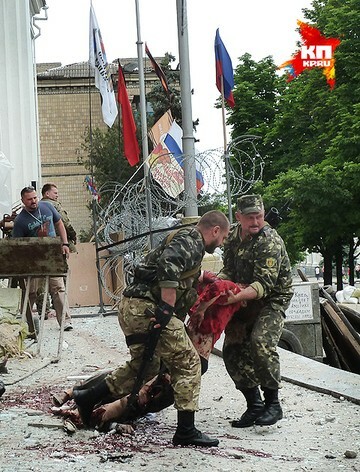 The US pays, directly and through the IMF for Ukraine's Kieven Junta to continue exterminating people in the east of the country. Today was no exception. 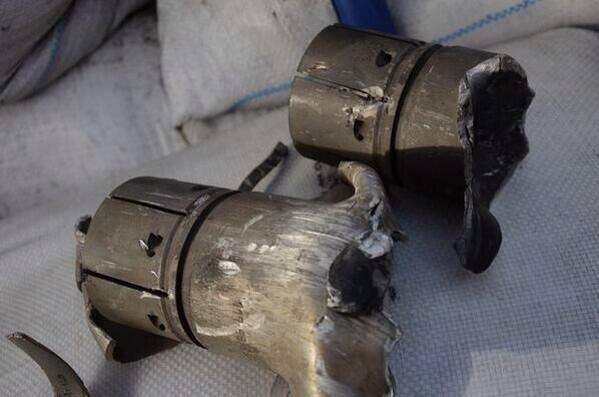 A Uki Nazi stormovik launched a cluster munitions missile into the central city administrative building in Lughansk. This building is in the very center of the city and is always full of people walking by, enjoying the fountains. This author from personal experience can attest to just how peaceful the area was. 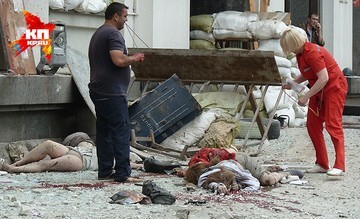 The end results of this massacre was 7 dead and twice that number wounded. The missile exploded against the building, so that several offices were also destroyed, including the office of the Minister of Ecology. Aiding the wounded was further hampered by the fact that about a third of the cluster munitions normally do not explode and are designed to implant themselves as a mine field. The Junta of Washington owned genociders and war criminals declared in their state and oligarch owned media that this was all the doings of the Lughansk army. According to this warped logic, they launched a missile at the fighter-bomber and instead it went after the airconditioners' heat signature. This is of course absurd as the exhaust of a jet engine can not be compared to anything as mundane as an air conditioner coil or even a dozen. Further, anti-air shoulder fired missiles are small, it does not take much to knock out a jet if it impacts. But Washington, a city of diabolic evil is backing this story or for the US slaves, just not reporting it. And of course we know that this strategy works as now 68% of the US population wants war with Russia. One only needs to troll through one of their forums, such as Free Republic or Democratic Underground to see the level of inbred stupidity and evil that is on display. So below are very graphic videos that you will never see on the "free" press of the West, showing just the results of America's money "well" spent. Hope this keeps at least a few Americans up all night, contemplating the evil they vote for and support, through direct action or silence. Knowing what is happening and doing nothing about it, by the way, will damn you to the Hell you deserve for letting evil flourish while you keep your collective heads down. Even in the afterlife, the likes of Obama and Kerry and McCaine will lord over you when they meet you in Hell. Think on that. It is time for Russia to set up a no fly zone, shoot down the US paid for pilots. If NATO's pilots want to meet God in a hurry, they are welcome to come challenge it. And on a side note: the first Israeli volunteers have arrived in Slovyansk to fight the American paid for thugs. Twenty former special forces soldiers. They say several hundred will soon follow. This is getting interesting. Most Americans simply do not care about the suffering that the US is causing in other countries. Most Christians in the US do not care about the suffering of Christians in the Middle East caused by US support for jihadis and the Muslim Brotherhood in Libya, Egypt, and Syria, or about the Christian apocalypse that the US set the stage for in Iraq. Americans are already beating the drum for the evil hag Hillary who had a hand in many wars: Yugoslavia, Libya, Egypt, Syria, and Iraq. The Republican will be equally bad. I have come to the conclusion that nothing will stop the US Empire until it is checked by a countervailing force equal to it. We have to hope for the emergence of a Russia/China/India and other BRICS alliance that is economic and military. Russia had played brilliantly and avoided the traps set by the US. I hope that Russia can hold the line in Ukraine and Syria. Thanks God we can be sure that soon (hopefully very soon) the western world will be attacked by the forces of the rising sun. In the mean time "WE" pray for wisdom and sense for OUR President, People and Russia and the people in Oekraine, and that the whore like thugs on the hand of america will be destroyed. Just praying is a mighty weapon if not the best. I have done what I could to help turn this country (US) around in the political world, but I can do no more. God's judgment will be poured out on it like none other in history. We will leave when the Lord says so. 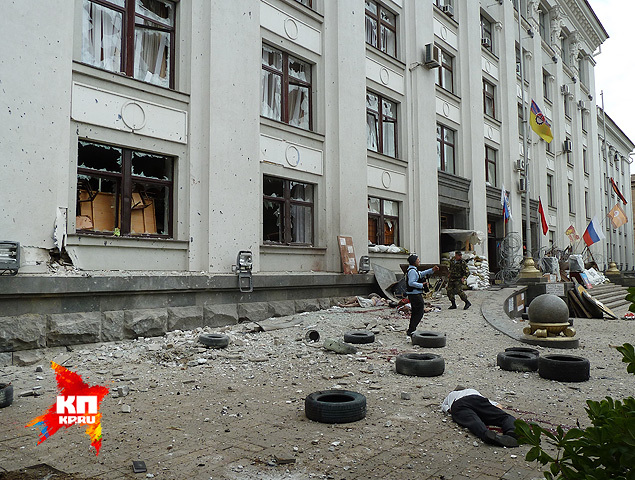 I have prayed much, shed many tears and certainly have had sleepless nights over what is happening in the Ukraine. They are brave and good people and don't deserve this evil. I'm sure I am not the only one grieving over the atrocities. I am happy to hear that Israelis are helping out. They certainly have the experience with the horrors of terrorism. Hi, American here. Is it too late to petition for asylum or citizenship in Russia or another former soviet/CIS country?